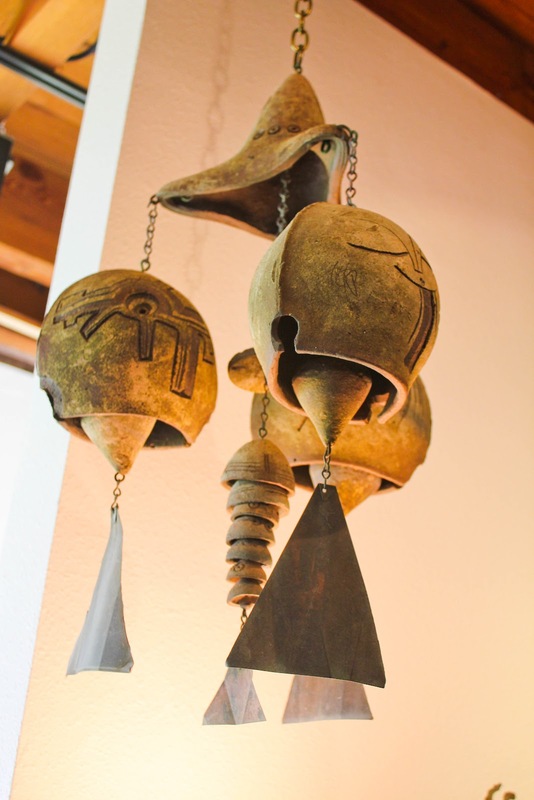 These amazing windbells by the visionary urban planner and designer Paolo Soleri dangle off the front of a private bungalow-style home in the center of Laguna Beach. (The home was featured in last year’s Charm House tour.) 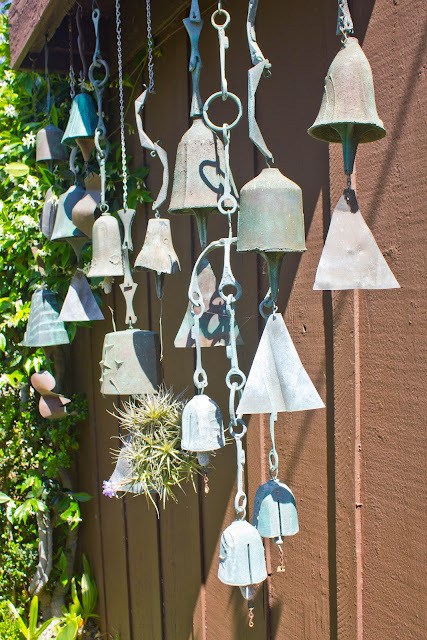 Once you notice these mid-century bronze or ceramic chimes–and decide you LOVE them and need to have your OWN–you start to spot them all over town. If you are really lucky, you can still find the older pieces at local garage sales. 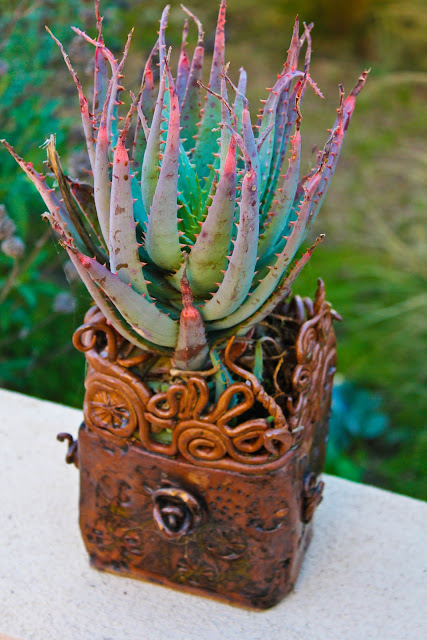 A boutique in town used to sell them, so they are in many of our local homes. 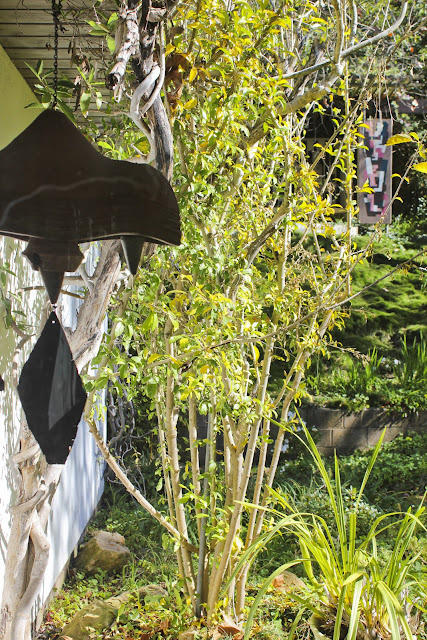 Even our hometown garden star, Hortense Miller, had a large Paolo Soleri Windbell in her garden. 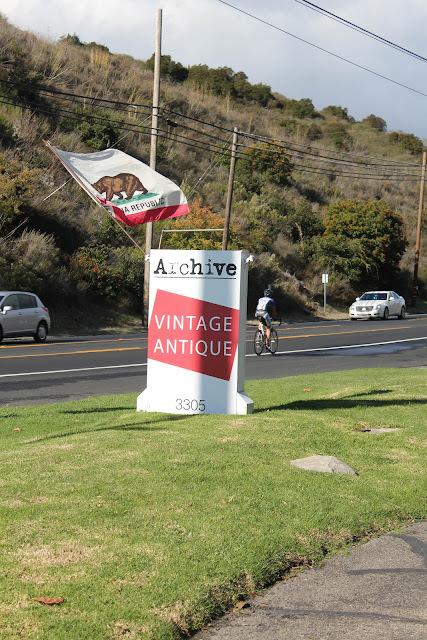 So you can imagine how excited I was when I visited the fabo new mid-century store called Archive, located in Laguna Canyon, and saw their collection for sale! They had about a half dozen windbells, both ceramic and in bronze. 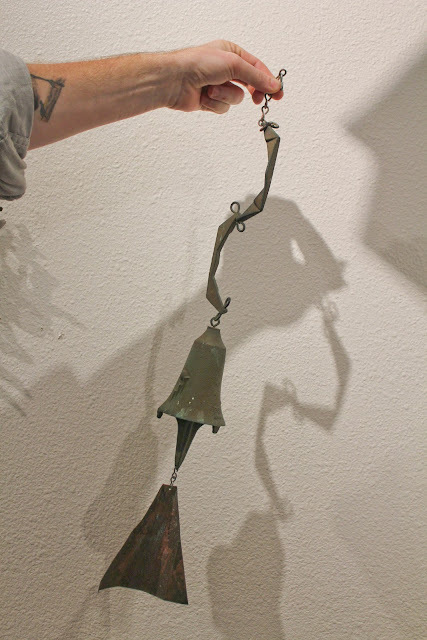 This piece, an older ceramic windbell, was several hundred dollars. 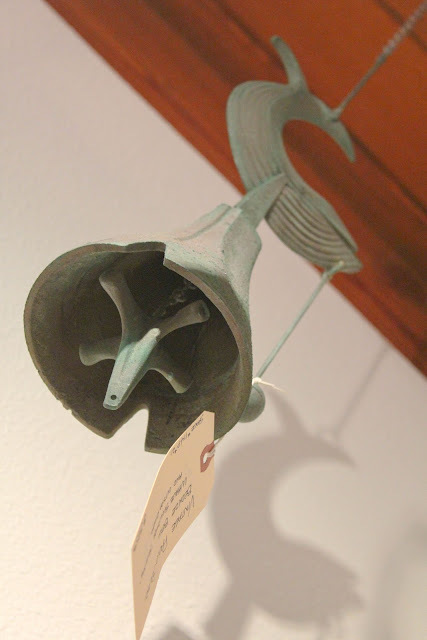 However, even if you don’t hit the garage sales, you can still buy new Paolo Soleri windbells HERE. They are still in production out of his studio in Paradise Valley, Arizona. According to their web site, they sell about 25,000 windbells a year. Even cooler than these bells, however, is that proceeds of their sales fund his amazing urban planning project, called Arcosanti. 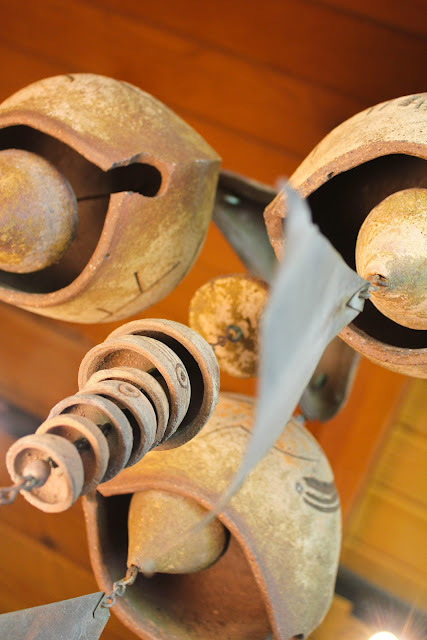 Since the 1970s, Soleri has been building a prototype of a sustainable mini-city for 5,000 people, using the same earth casting techniques to make these bells. Paolo, born in 1919 and apparently still touring and lecturing, started thinking about sustainability in the 70s, when some of us remember it being called “ecology.” The goal of his city is to minimize energy use, reduce waste and pollution, interact with the land and encourage social interaction and accessibility. Sound familiar? Some people got interested in these values in the 60s and 70s, and never stopped pursuing them, even when they fell out of vogue. 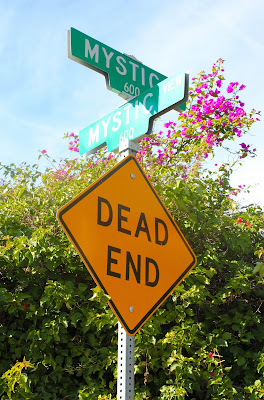 We have a lot of those types (now older) living in Laguna Beach (my kids called them “hippies,” which some of them were. But most of them simply shared these progressive values) who are like-minded to Paolo–artists who care about nature, gardens, beauty and not ruining what we have. Next Post: Spring For It! 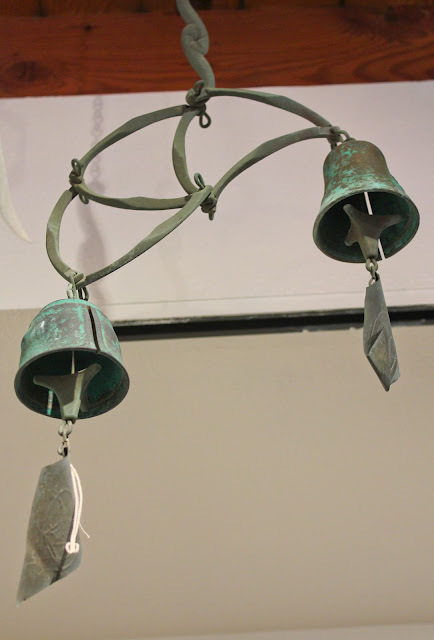 I've been in love with these bells forever and recently found one at a garage sale! They used to sell them in a little shop in downtown Laguna that's long gone now. When my MIL was in Arizona- at least 20 years ago, she picked one up for me and my husband..At the time I didn't think much of it.. Should of known better.. Even tho my MIL was a pita at times, she definitely knew art… A lover of O'Keefe and southwestern art…. I still have the windbell and the patina on it gets better every year!. heh, I am down for a road trip to Arcosanti too . Roadtrip! – I have been collecting for a bit now and love them. 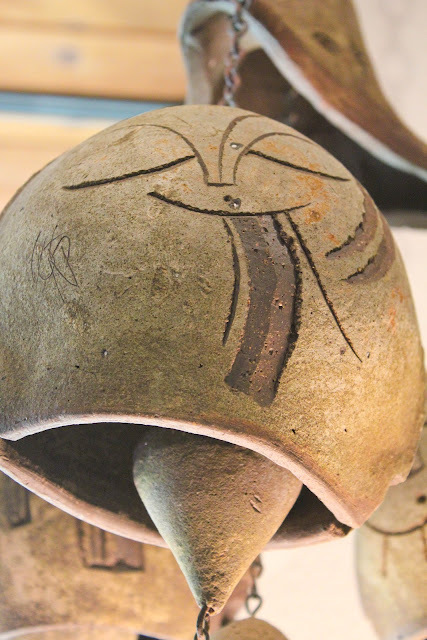 I am not sure that last beautiful curved one is a Soleri though- I think the ones with the more curvilinear hanger maybe anothter guy who's name i have forgotten? Still damn stunning though. 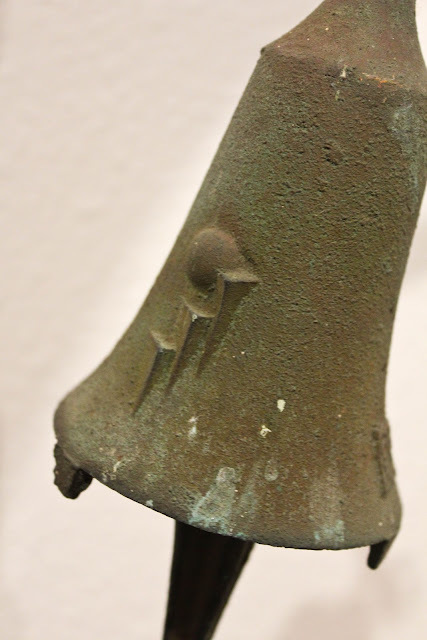 I think the last one may be an older bells by Jeff Cross for Harmony Hollow which usually bears a shell on it somewhere – the new ones aren't as nice. Love the bells. I am always in search of new ideas and inspiration to reshape my living space. The photos are well done and helpful. They have spawned new art projects and will direct me when I am looking for art.